Seattle Parks and Recreation invites families, friends and neighbors to an Open House meeting on the Gas Works Park Play Area renovation project on Tuesday, Sept. 9, 2014, 5 to 7 p.m., near the play area at the park. Gas Works Park, located at 2101 N Northlake Way, offers many park features including a play area. This project provides renovation to the play area to enhance the play value for children, provide amenities for children and their caregivers, and to improve accessibility for all users. At the Open House, the community has the opportunity to learn about the renovation and provide feedback on the schematic design. Seattle Parks staff will be at the meeting to discuss the project and answer questions. The 2008 Parks and Green Spaces Levy allocates $1.4 million for planning, design and construction for the Gas Works Park Play Area renovation. 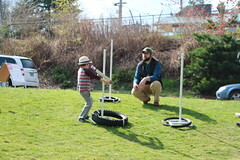 For more information about the play area project, please visit http://www.seattle.gov/parks/projects/gas_works/ or contact Pamela Alspaugh, Sr. Landscape Architect, at 206-684-7328 or pamela.alspaugh@seattle.gov. Currently at Gas Works Park, Puget Sound Energy in cooperation with Seattle Parks and Recreation is working on a soil cover project at Kite Hill. This area of the park is closed until Memorial Day 2015. If you have questions about this project please contact David Graves, Seattle Parks and Recreation, at david.graves@seattle.gov or 206-684-7048. Seattle Parks and Recreation begins construction on Monday, Jan. 6, 2014 at Woodland Park Play Area. The project at 1000 N 59 St., will replace play equipment, provide access improvements and complete work as necessary to improve the existing play area. During construction the play area will be closed to the public. It will open when completed in April 2014. Construction was postponed to allow families to use the play area during Seattle Public School’s winter break. 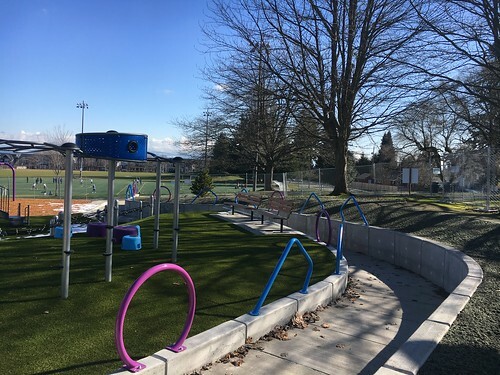 The Woodland Park Play Area project is funded by the Parks and Green Spaces Levy which allocated $350,000 for design, planning and construction. In 2012, public meetings were held to gather community input for the project. Thank you to those attended and participated in the process. If you have additional questions please contact project manager, Patrick Donohue at patrick.donohue@seattle.gov or 206-684-9286. Seattle Parks and Recreation will host celebrations for the new Maple Leaf and Volunteer Park play areas this week. Funding from the Parks and Green Spaces Levy contributed to both play area renovations. 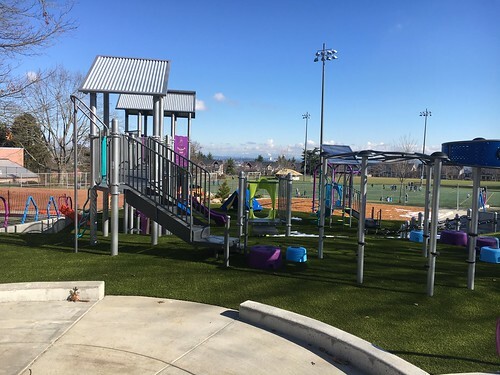 These projects provide new play equipment and bring the play areas into compliance with current safety standards and guideline efforts, and meet the requirements of the Americans with Disabilities Act (ADA). Seattle Parks has completed 19 of the named 23 play area renovations since the Parks and Green Spaces Levy passed in 2008. Seattle voters passed the Parks and Green Spaces Levy by a 59% vote in November 2008. The $146 million Levy provided acquisition funding for new neighborhood parks and green spaces and development funding for projects such as play area renovations, improved playfields, reservoir lid parks, community gardens, and safety upgrades at city owned cultural facilities. The Volunteer Park play area dedication is Friday, May 17, 2013 from 4 – 6 p.m. The event features music by CHORAL5 from Stevens Elementary along with other family entertainment and light refreshments. Seattle Parks and Recreation will celebrate the opening of the new play area at Volunteer Park on Friday, May 17. The renovated play area offers musical components, climbing rocks, climbing wall, slides, higher swings, and a new sand box. The design of the new pathways is sensitive to the original Olmsted plan and mimics the historic promenade. The Volunteer Park play area opened to the public in mid-April. It is located in the northeast corner of Volunteer Park, 1247 15th Ave E.
The Maple Leaf play area dedication is Saturday, May 18, 2013 from 10 a.m. – noon. The park features a zip line, climbing rocks, and a children’s garden. The new play area at Maple Leaf Reservoir opens several months in advance of the completed reservoir covering project. In conjunction with Parks and Green Spaces Levy, a Large Matching Fund Award of $100,000 from the Department of Neighborhoods provided funding for the children’s garden, adventure play and whimsical art area. The community raised $75,000 in cash to support the effort and contributed $25,000 in volunteer labor. The event on Saturday includes family entertainment and light refreshments. Seattle Public Utilities (SPU) is replacing its open reservoirs with underground structures that will improve the quality and security of our water supply and provide new public open spaces on reservoir lids throughout Seattle. The Maple Leaf Reservoir is one reservoir that is getting covered. Seattle Parks, along with the contractor, worked hard to have the play area portion of the park open to the public for the summer 2013. Construction for the reservoir project will be complete in fall 2013. The play area is located at 1020 NE 82nd St.
Seattle Parks and Recreation is hosting a community celebration for the renovated Roxhill play area and the new skatespot on Saturday, April 20, 2013 from 11 a.m. – 2 p.m. The official ribbon cutting will take place at 12:30 p.m. The afternoon will be filled with skate lessons, giveaways, music and light refreshment. Roxhill Park is located at 2850 SW Roxbury St. in West Seattle. The community knows Roxhill Park as the “Castle” park and at this celebration they will celebrate that it will still be known as “Castle” park and the new streetscape skatepark north of the play area. In 1994, the community built the original castle play structure at Roxhill Park. In 2011, during the extensive community planning process for the Parks and Green Spaces Levy funded play area renovation project, the community learned that the castle would be removed. They made a commitment to organize the volunteers required to complete the “build” of another Leather and Associates play area design. The community build was realized over five days in early November 2012, resulting in the new castle structure and play area. The volunteer and community support was great! The Parks and Green Spaces Levy included $450,000 for planning, design and renovation of the play area and $600,000 for the planning, design and construction of a skatespot. 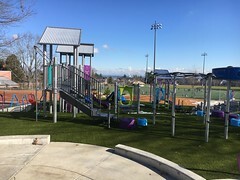 The community received a Department of Neighborhoods Small and Simple Award of $20,000 that allowed for the community build out of the play area. Seattle Parks hosted five public meetings for these combined projects and presented the skatepark designs for review by the Seattle Design Commission. The Citywide Skatepark Plan, developed through Seattle Parks and Recreation with extensive community input, recommended Roxhill Park as a good site for a skatespot. In Seattle, a skatespot is defined as a skatepark ranging in size from 1,500 to 10,000 square feet. The Rob Dyrdek Foundation (now the Street League Skateboard Foundation) donated design services and skate features for the park from Street League Pro Tour. Parks’ in-house landscape architects worked with California Skate Parks, who designed the skatespot. Parks awarded the construction contract for the skatepark to Grindline Construction of West Seattle. The Roxhill Park skatespot is the Street League Skateboard Foundation’s eighth “Safe Spot Skate Spot,” a program conceptualized by Rob Dyrdek, which seeks to create safe and legal havens for skaters across the country. The main goals of the program are to provide communities with safe and legal skate plazas, increase and encourage the active engagement of people in the sport of skateboarding, and design and develop skate plazas in cities and towns throughout the world. The program also provides an alternative option for communities with limited budgets or space restrictions to develop real street-skating locations. Roxhill Park improvements are the result of many public/private partnerships working together. This event celebrates both the completion of the project and the amazing work done by the neighborhood, the extended West Seattle community and the entire skate community. For more information on the project please visit http://www.seattle.gov/parks/projects/roxhill/ for more information about this event please contact Karen O’Connor at 206-233-7929 or Karen.o’connor@seattle.gov. For more information on the Street League Skateboard Foundation, please go to http://robdyrdekfoundation.org/. The newly renovated Volunteer Park play area will open to the public on Tuesday, April 16, 2013. Fencing around the play area will be removed before the end of the day Tuesday, but fences around the upper lawn will remain until early June to allow the grass to establish. The play area is located near the 15th Ave. E and E Galer St. entrance. The newly renovated play area at Volunteer Park has plenty of space to play, including climbing rocks and a climbing wall. The play area offers musical components, climbing rocks, a climbing wall, net, slides, higher swings, and a new sand box. The play area now features wheel chair access onto the small play structure and into the two play spaces. ADA compliant pathways connect the play area and wading pool with the restrooms and parking area to the west. The design of the new pathways is sensitive to the original Olmsted plan and mimics the historic promenade. Olmsted style benches will be added near the wading pool. The existing Block (“bone”) play sculpture, created by Chas Smith in 1962, remains in the renovated play area. The design also retains the shooting star paving feature and Pablo’s plaque installed as part of the 1991 Neighborhood Matching Fund project. During the 2011 design process Volunteer Park was approved as a Seattle landmark. Prior to the park’s landmark status, the Seattle Asian Art Museum and the Volunteer Park Conservatory buildings were individually landmarked. The Parks and Green Spaces Levy funded the renovation of the play area. The play area has all the traditional stuff like slides and swings, but also includes unique features such as musical components. Seattle voters passed the Parks and Green Spaces Levy by a 59% vote in November 2008. The $146 million Levy provided acquisition funding for new neighborhood parks and green spaces and development funding for projects such as improved playfields, reservoir lid parks, renovated playgrounds, community gardens, and safety upgrades at city owned cultural facilities. Mayor Mike McGinn joins members of the community to cut the ribbon on the new play area. The Downtown Seattle Association (DSA), City of Seattle and Seattle Children’s Research Institute have partnered to open a brand new play area in Westlake Park. The year-round play area includes a soft, rubber-like surfacing and a Geode by Goric. This large, netted spherical structure and a collection of large domes is surrounded by a fence with bench seating in some areas. The design and elements involved were selected specifically with sightlines and function in mind, as the structures do not obstruct views to the retail spaces and through the park. Geode is designed to be used by children up to 12 years old. Currently, amenities for families, such as parks and play areas for kids, are deficient within the Downtown core, with an exceedingly low number of existing public spaces oriented or designed for children. Filling this gap has become imperative with some 3,000 children calling Downtown home and the Downtown residential population increasing by 20 percent since 2000, and more than 70 percent since 1990. The play area will also serve as an amenity for the tens of thousands of children who visit Downtown every year. 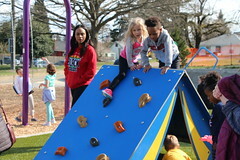 Children joined Mayor Mike McGinn at the opening of the new play area. In addition to bringing a fun and family friendly environment, the new play space will also provide health benefits. 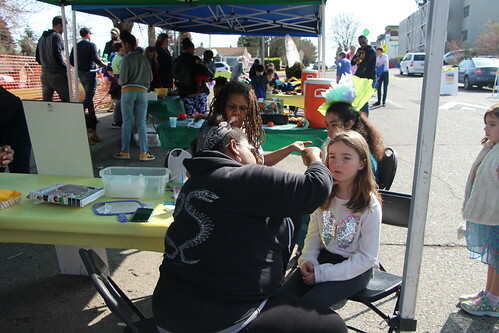 A study led by Seattle Children’s Research Institute found that children living in neighborhoods with favorable neighborhood environment attributes, including quality parks, had 59 percent lower odds of being obese. Seattle Parks and Recreation and the Downtown Seattle Association (DSA, http://www.downtownseattle.com/) are excited to announce the construction schedule for installing the new Westlake Children’s Play Area. Work is projected to begin on Monday, February 18, 2013 and to last 5-7 days with an opening celebration on Friday, March 1, 2013 at 11:30 a.m. The new play space will open on March 1 in Westlake Park. Half of the park will be required for installation and construction staging. The play space will be located on the east edge of the park, about midway between Pike and Pine Sts., across from the Metropolitan Building. Westlake Park is located in the heart of downtown Seattle at 401 Pine St.
DSA has partnered with Parks to help make downtown more family and kid-friendly by providing this small play space for children. This is a two year pilot program. The play space will be encircled by attractive low fencing and benches where guardians can relax. Inside the play area will be two exciting play elements. The first is called a Mini Geode, a climbing structure with a combination of rounded and linear beams forming the outside sphere and a complex inner structure of ropes. The second structure is a grouping of three rolling climber domes made of stainless steel. The surfacing will be a forgiving rubberized material that rests directly on top of the existing pavers, allowing it to be removed without much disruption. Some of the existing planters have been relocated and pedestrians will be able to move smoothly past and around the play space. Mithun (Mithun.com) volunteered their creative skills to design the space and Lease Crutcher Lewis (lewisbuilds.com) generously volunteered to install the play equipment. Seattle Children’s Research Institute (http://www.seattlechildrens.org/research/) is the presenting sponsor for this project. Seattle Parks and Recreation is happy to announce the completion of the Bitter Lake Reservoir Enhancement project. Parks anticipates removing construction fencing and opening the area for community enjoyment by Thursday, January 10, 2013. The project site is located along N 143rd St. and the corner of Linden Ave. N.
The overarching goal for this community initiated project is to provide a park-like atmosphere with useable amenities where the Bitter Lake community can gather and play. The Parks and Green Spaces Levy Opportunity Fund project provides a new creative children’s play space between the new P-patch and the existing plaza along with plantings and irrigation near Mark Lere’s “Seattle Scatter Piece.” The area now meets current Americans with Disability accessibility and safety standards. This project is one of 15 projects to receive funding through the first round of the Parks and Green Spaces Levy Opportunity Fund. The Opportunity Fund provides $15 million in funding for community initiated park development or property acquisition projects. 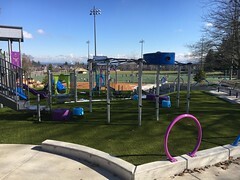 To view other projects that received funding please visit http://seattle.gov/parks/levy/opportunity.htm. For additional information about the project, please visit http://seattle.gov/parks/projects/bitter_lake_reservoir/enhancement.htm or contact Kim Baldwin, Project Manager at 615-0810 or Kim.Baldwin@seattle.gov. Seattle Parks and Recreation invites the public to participate in the final public meeting for the Montlake Play Area on Wednesday, December 5, 2012 from 6:30 – 8:30 p.m. at Montlake Community Center, 1618 E Calhoun St. The Parks and Green Spaces Levy provides the funding for this project. Seattle The $146 million voter-approved levy provides acquisition funding for new neighborhood parks and green spaces and development funding for projects such as improved playfields, reservoir lid parks, renovated playgrounds, community gardens, and safety upgrades at city owned cultural facilities. Parks encourages the community to come and learn about the next steps for this project. For more information please visit the website or contact Pamela Kliment, Parks Planner, at 206-684-7556 or Pamela.Kliment@seattle.gov. Seattle Parks and Recreation invites the community to participate in the second public meeting for the Montlake Play Area on Tuesday, October 30, 2012 from 6:30 – 8:30 p.m. at Montlake Community Center. Montlake Community Center is located at 1618 E. Calhoun Street. In September, Parks conducted a workshop to help gather input about this neighborhood park play area and the equipment that will be installed. At this second meeting, Parks will present the schematic designs that were developed from input and will gather additional public comments. The third and final meeting to be held in December is an opportunity for the community to see the final design, and to learn about the next steps in the project. The play area is located at 1618 E. Calhoun Street, Seattle, WA 98112. Parks encourages the community to come and provide input on the play equipment and design features that work best for your neighborhood. or contact Pamela Kliment, Parks Planner at 206-684-7556 or Pamela.Kliment@seattle.gov.